I was a second lieutenant straight out of Signal Corps Officer Candidate School Class 5 when I reported into the Signal Corps Pictorial Center 2nd Signal Photo Platoon about the 15th of May 1952. I was in Class 5 and came up with two others from my class. They were Rex Best, deceased, and Herbert Hill. There were about 20 officers and 40 enlisted men when I arrived. When I left for Korea in December of 1952 there were probably 40 officers and 20 enlisted men. 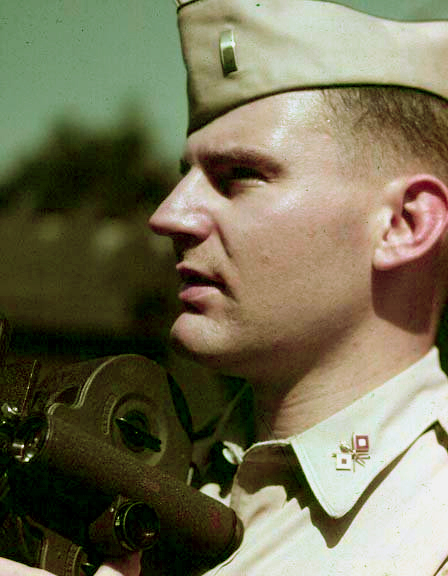 Captain Roberts was the CO of the platoon. There was no BOQ at the SCPC. I was given a quarters and rations allowance even though I was single. That made my take-home about $300 a month. I found a place in Jackson Heights that cost me $50 a month. I shared a room with an IBM engineer in a ten-room house. Very comfortable. To get to the SCPC I used mass transit. I would take most of my meals at the SigPho Officers Club. Meals ran about 25 cents. During my enlisted time I had been assigned duty as a 6X6 driver. So I took my SCPC drivers test on the streets of Astoria driving a 6X6. The Platoon had several Jeeps and Weapons Carriers assigned to it. They were not accumulating enough miles to justify keeping them. So the whole platoon would mount up and go on a motor march periodically. On one motor march we went down to Sheepshead Bay and charted a sport fishing boat. We even caught some fish. We were supposed to be off site backup to the SCPC. We had very few assignments. The platoon had a big inventory of 16mm cameras and plenty of film. So we would make up assignments for training purposes. The footage was critiqued by the group and then given to the photographer to keep. I have several hundred feet of footage shot in and around NYC. It was mostly B&W. Several years ago I had the best put on video tape. Most of the film can no longer be projected. One of my offsite assignments was to Camp Hero at Montauk Pt on the end of Long Island. We went out with a Weapons Carrier, a Jeep and Lt. William Becker's new Pontiac hardtop. The assignment was to make a film of a 90 mm AAA Battery firing at tow targets. At that time AAA Batteries were stationed around all the East Coast cities. Visibility had to be almost unlimited. We were there a week and never saw a shot fired. We did fire off a lot of the still man's flashbulbs though. When they turned on the tracking radar every flashbulb he brought went off. His Speed Graphic case was smoking from the heat of the flashbulbs. The first day we were there a bus pulled in from Ft. Monmouth with about 30 students from the Radar School. The Sgt. in charge of the group tried to report in to the AAA group. They told him to come over to the BOQ and report in to one of us SigC Officers. 2nd Lt. Dan Carson had rank over Becker and myself. Dan had just gotten out of the shower and took command of the Monmouth group with a towel wrapped around him. There was a big resort hotel at Montauk. We were there before the summer season had started. The hotel had a large staff of single girls. We went down to the beach after a fruitless day at Camp Hero and found about 50 young ladies lying around on the sand. With no other men around we pretty much had thing to ourselves. Lots of fun. My longest TDY was on assignment to Camp Polk, Louisiana. We were to support tests the Chemical Corp was performing. I left Penn Station with two EM and 30 pieces of luggage on a Saturday. We had to be ready to film as soon as we got there so we had cameras, film, tripods, batteries, etc in our Pullman Drawing room. We changed trains in St. Louis and Texarkana. We used a porter to move the stuff between trains at a quarter a bag. When I got back my luggage handling expenses were denied. So I made do on my $9 per/diem. We arrived in Camp Polk on Tuesday as I recall. We set up our three 35mm Eyemos with 400 foot magazines on a ridge overlooking the training ground. Soldiers equipped with different types of gas masks were the test subjects. As they moved into our camera's view a gas attack was simulated by setting off primacord in the test area. We filmed the action as the troops struggled with their gas masks. We ran the test twice, loaded up our gear and got back on the train for NYC. Our captions were pretty skimpy. My ears burned a little during the showing of the rushes. The prints were turned over to the Chemical Corp people for their analysis. I imagine the negatives are still in the vault someplace. One of the officers father had a film studio in Chicago. 2nd Lt. Warren Lieb asked me if I would like to take leave and help he and his father film a week long cruise from NYC to Bermuda, the Bahamas and back. The cruise left on Saturday and returned on a Saturday. His Dad's client was a travel agency in Chicago. I found out you could sign out on the following Mondays sign out sheet on Friday night. I took four days leave and got a day of grace. So I had to sign in on the following Friday's sign in sheet. This was still out on the following Monday morning for my convenience. With four days leave I got nine days off. We had access to old Kodak Cine Specials which had rewind and double exposure capability. Lt Becker, Lt Best and myself scripted some "Ghost " movies as training exercises. They were quite a hit. Everyone started making "spook" films. My kids really enjoyed them when they were small. Now my grand kids are enjoying them. I pulled "Officer of the Day" once as I recall. All the guards were civilians. I would have to make the rounds in the studio every couple of hours or so. I remember going into the casting office and looking through some of the actors portfolios which were on display. Tough guard duty! I performed the duty without a weapon. In Korea I was issued a 45 automatic which I wore at all times. In January 1953 I reported into the 304 SigC Operations Battalion in Seoul, Korea. Footage I took of a UN attack on a Chinese position was released to the newsreels in March of 1953. The release number was 39-53. Later on I was assigned to cover the activities at Panmunjom leading up to and including the Sick and Wounded exchange. On the first day of the exchange about 20 SigC photographers showed up to cover the event. The head of Army Photo, a Col. Stafford as I recall, was also there. We had a meeting of all the various groups and the Col. put me in charge of the whole operations. I had a photographer on about every turn in the road from Panmunjom to Munson-i. I finished my active duty in November, 1953 and enrolled in Kansas State, graduating with a BS in Geophysics in 1956. In 1991 I took my wife up to NYC. We visited the Museum of the Moving Image which now occupies the old SCPC. I was disappointed that there is very little mention of the time the facility was used by the Signal Corps. There was a model showing the use of television in a training capacity. The old building that housed the 2nd Signal Platoon was gone. The neighborhood looked familiar though. I'm attaching a couple of photos. One is my photo ID from SCPC. The other is of myself holding a 35 mm "Spider" Eyemo. The color photo was made with a 4X5 Speed Graphic and Ektachrome film. The Ektachrome has faded pretty badly. Computer enhancement has helped quite a bunch. We had good cameras at SCPC. In Korea we had "Junk." I enjoyed the web site. Thanks for the effort. As a Kansas farm boy I can say my assignment at the SCPC was the best experience I had in the Army. Posted April 1, 2006; updated March 8, 2019.